Say words. Match words. Memorise and rhyme words! Which ones go together? How are they pronounced? 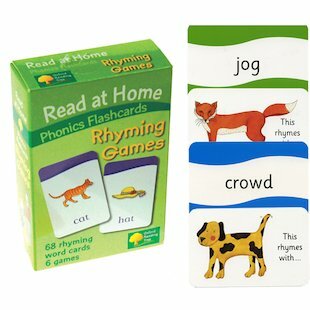 Get busy with these fantastic rhyming flashcards from the popular Oxford Reading Tree scheme. Each bright, chunky card features a rhyming word and picture for use in six fantastic learning games including Find the Rhyme, Make a Rhyme and Snap the Rhyme. They also support synthetic phonics learning. So get busy – get rhyming!